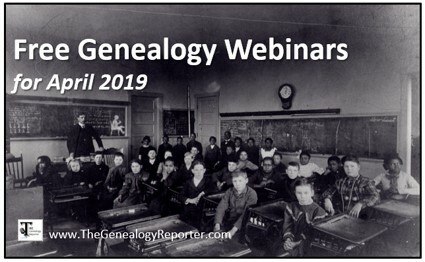 We have your list of free genealogy webinars for April 2019 and they are among the best! Tips and tricks to find records on FamilySearch, Amish genealogy, evaluation of evidence, and researching in burned counties are just a few of the outstanding lectures for this month. Not sure what a webinar even is? Click here to learn the details, then return back to this page to see all the top-notch webinars available for the month of April! You don’t have to be in Utah to enjoy wonderful classes regarding genealogy and family history. 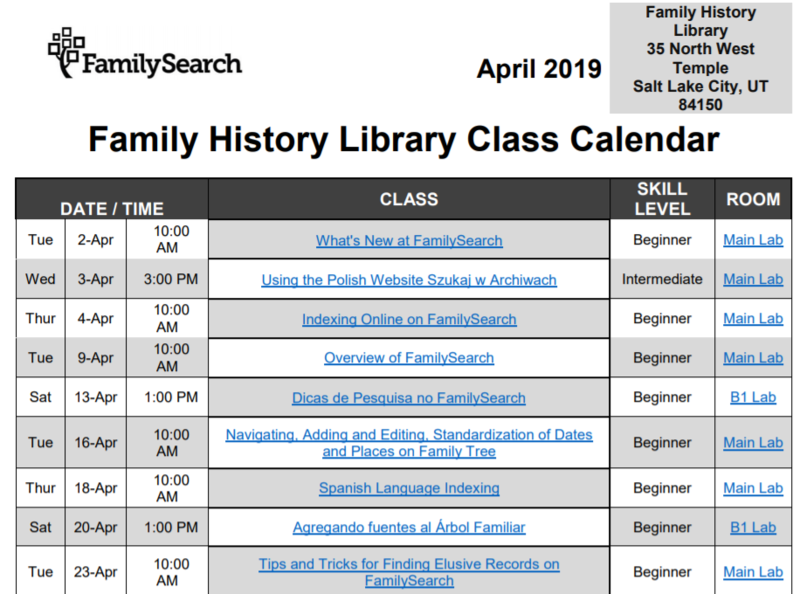 The Family History Library in Salt Lake City offers numerous webinars each month. Their list is quite extensive and cover a wide variety of topics. The image below contains just a sneak-peek at what’s coming up these next few weeks from the Family History Library’s webinar series. Check out the entire list by clicking on the image below. Once on their web-page, if you see a class title you are interested in, click the hyperlink that says “webinar” about 15 minutes before the webinar is to begin. (Remember, Utah is on Mountain Standard Time.) You will be directed to enter your name to join in on the webinar. You may also need to download Adobe Connect or install Adobe Flash. Just follow the directions, they will let you know what (if anything) you need to download or install to be able to watch the webinar. Don’t worry, it’s really quite easy! Legacy Family Tree Webinars also has free content each month. Though it is a subscription site, they offer free webinars several times a week to the public. If you miss a live webinar, you have a week to view it for free. Here’s a glance at a few of the upcoming, free genealogy webinars coming up at Legacy Family Tree Webinars. Click on the titles below to see a description and register for free or click here to see all the free webinars for April. April 10 – “Plain Folk: Researching Amish and Mennonite Families,” presented by Peggy Clemens Lauritzen, AG. April 16 – “Transcribing Documents: There is More Than Meets the Eye!“ presented by LaBrenda Garrett-Nelson, JD, LLM, CG, CGL. April 17 – “Boost Your Germanic Research: Understanding Historical Jurisdictions,“ presented by Teresa Steinkamp McMillin, CG. April 23 – “Censuses Around the World: What You Need to Know About Census Collections and Genealogy,” presented by Mike Mansfield. State Societies Offer Free Genealogy Webinars, Too! Free genealogy webinars are being offered from state genealogical societies, too. Be sure to check your own state society to see what is offered. Here is a short list of some of the webinars you might be interested in for the month of April. You do not need to be a member of these societies to enjoy the live webinar. Click on the hyperlinked society’s name and you will be directed to a page to register for the upcoming webinars. “Tracing Female Ancestors in WWI Military and Non-Combatant Records,“ presented by Debra M. Dudek, MSc, Wednesday, April 17, 6:00 PM – Pacific Time — Women were essential to the success of America’s troops in World War I. This lecture will outline a plan to locate and use a variety of local, state, and national records to discover the stories of female ancestors serving in military and volunteer roles. “Using Bureau of Land Management Tract Books,” presented Michael John Neill, April 9, 8:00 PM – Central Time — This presentation will focus on use of the un-indexed tract books created by the Bureau of Land Management as a part of the patent application process. “Picture This: Cataloging Digital Family Photographs,” presented by Nancy E. Loe, Tuesday, April 16, 7:00 PM CST — Family photographs may seem so complex that they defy organizing. Tame your digital family photographs by learning how to insert names, dates, and other information inside images to make them searchable. “The Discriminating Genealogist: Telling Good Evidence from Bad,” presented by Judy G. Russell, JD, CG, CGL, April 25, 8:00 PM EST — The “best evidence” rule in law requires the presentation in court of an original rather than a copy, and a copy won’t even be admitted if the original is available. In genealogy, our rules require us to do the same: to discriminate, choose in favor of, prefer certain types of evidence to others, certain bits of information to others, certain sources to others. “Burned County Research Methodology,” presented by Victor C. Dunn, CG, April 11, 8:00 PM EST — This lecture discusses the effective use of surviving county records and then focuses on Federal and state records that provide genealogical information such as military, pensions, Southern Claims, Serial Set and state land grants that help fill in research gaps. Enjoy Over 600 Webinars from Home! 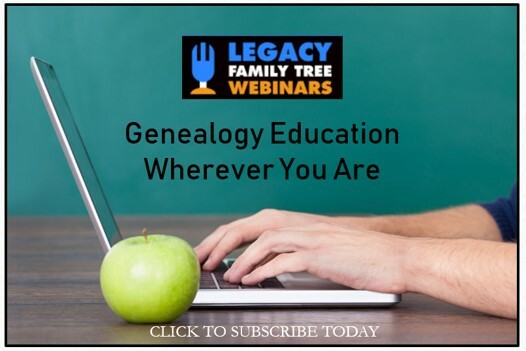 Purchase a year of genealogy education and enjoy over 600 online genealogy related webinars at the low price of $49.95 from Legacy Family Tree Webinars! New webinars are being added weekly and you won’t find a genealogy conference with this level of expertise at such an affordable price anywhere else! Click the image to subscribe today! The Genealogy Reporter has entered into an affiliate relationship with Legacy Family Tree Webinars. Clicking on links in this blog post may result in a commission being paid to The Genealogy Reporter at no additional cost to you.